Meathead Movers is here to take care of the heavy lifting for you on your move to Colma. Our clean-cut student athlete movers are ready to get you safely settled into your new Colma home. Welcome to Meathead Movers of Colma! If you are moving to or from anywhere in Colma, we are the moving company for you! Our professionally trained student-athlete movers and our moving concierge service are here to help you with every stage of your move in Colma. Known worldwide as the “City of Souls”, this small town is home to over 1400 residents and 1.5 million “souls”. With its proximity to San Francisco and 16 cemeteries, Colma is the final resting place of many governors, mayors, tycoons, Civil War Generals, artists, and even Joe DiMaggio and Levi Strauss. Despite being known as the city of souls, Colma is very much alive. With its Spanish and Mediterranean architecture, Colma boasts an old-world charm. The city also has a very actively involved recreation department, so there are always plenty of opportunities for fun. If shopping is more your style, there are two shopping centers within the city, and two Bart stations nearby to connect you to other Bay Area locations. 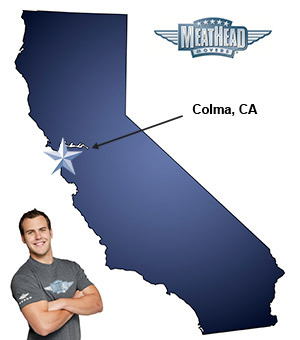 If you are looking forward to a move to Colma, Meathead Movers is here to help! Our moving company specializes in local, long-distance, and commercial moves to, from, and within Colma. We also provide reliable packing, storage, on-site relocations, and our distinctive moving concierge service, which connects you with local service providers. All our student-athlete movers are thoroughly screened and trained before their first move. With branches not just in Colma, but all throughout California, we are your one-stop resource for all your moving needs, no matter where your California move takes you. In fact, you can see what your neighbors in Colma have to say about us. With our 100% satisfaction guarantee, the only thing you have to lose is the stress that comes from moving! So contact us today for a free no-obligation moving quote and to learn how we can help you on your next move! Moving to Colma? Here are some helpful resources.